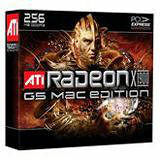 Feel the power of ATI's world class Radeon X1900 G5 Mac Edition. Designed exclusively for PCI Express based Power Mac G5 systems, it will turn your computer into a sophisticated graphics workstation and a monster gaming machine. The Radeon X1900 employs a state-of-the-art architecture that boosts the performance of all professional applications while delivering incredible 3D graphics and shader performance in games. Then it ups the ante with Avivo video and display technology, delivering movies, games, and photos in high-definition format with stunning color and realism.